These Little Camas plants have a shorter, lighter stalk, and a smaller flower than the larger Camas (the flowers on the header ) found in the interior of British Columbia and Washington. 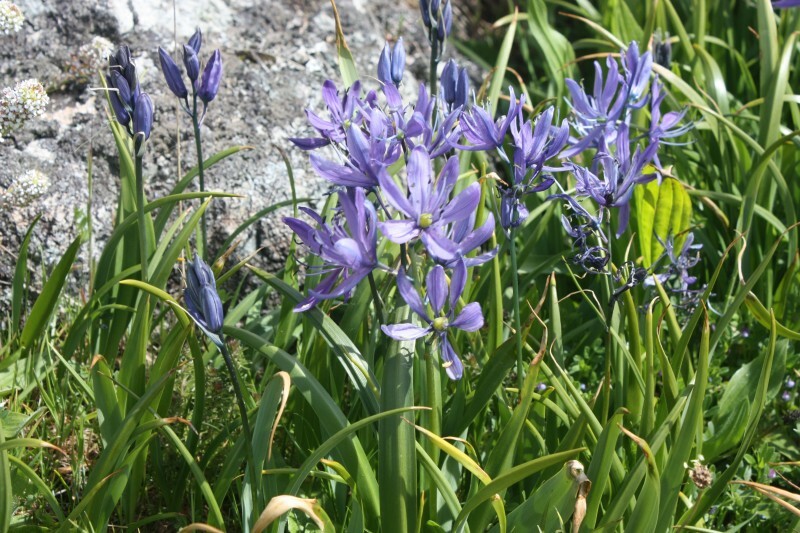 The Little Camas grow next to the sea shore, and were probably part of a garden of Little Camas bulbs, carefully tended and harvested by the Songhees Natives for food. These, too, were “Native Potatoes,” and the bulbs were roasted and stored for winter food. A new “Indian Potato” story has piqued my interest. I wrote about Native potatoes a few years ago on my old blog. After reading my post about the Potatoes grown at Fort Alexandria, a reader told me about Potato Mountain, where the Natives harvested “potatoes” every year, and where they had a special ceremony to celebrate their harvest. According to my ancient copy of the Canadian Board of Geographical Names for British Columbia, Potato Mountain — or the Potato range of mountains — is listed as being “Between Chilko and Tatlayoko Lakes, Range 2, Coast District.” According to the mystery book that came out a few years ago — On Potato Mountain: a Chilcotin Mystery, by Bruce Fraser — Potato Mountain is a high ridge of land that runs north-south between the upper reaches of the Chilco River (which flows north into the Chilcotin River), and the Homathko River which runs south through Waddington Canyon into Bute Inlet, on the coast north of Vancouver. I found nothing in A.C. Anderson’s writings, or in those of his son, that would have identified the plants they called “Indian Potatoes.” Both of these men would have been called experts in their fields, at that time. New experts have arisen, of course, and they have talked to the Natives and learned their stories, and studied the plants that Natives used. One such expert is botanist Nancy J. Turner, a professor of Environmental Studies at the University of Victoria. From her book, Food Plants of Interior First Peoples, I am able to identify some of the plants that might have been called Indian potatoes. The Yellow Avalanche Lily (Erythronium grandiflourum, Pursh.) is also called the Glacier Lily, Yellow Dog-tooth Violet, Snow Lily, or the Indian Sweet Potato. The plant grows from a deeply buried bulb and bears two pointed leaves that taper at the base. The flower is erect, about six inches tall, and bears one or more nodding golden-yellow flowers with prominent stamens and pistils — it looks like the Tiger Lily without its spots, in fact. The blooming season is from April to August. Considering that my source re Potato Mountain told me that the flowers the Natives harvested were called “nodding potatoes,” I think this may be the plant that bore that name. The Natives steam the bulbs or roast them in hot ashes. To preserve them for winter they let them soften and peel and thread them on a string of twisted Red cedar bark before hanging them up to dry. Our New Caledonian fields have already, I believe, yielded their humble treasures very liberally to poor David Douglas, who, if my memory fail me not, visited in 1833, when I was stationed elsewhere. Thus I cannot hope that my [small] collection will possess much novelty for you. The Tza-chin or edible Bitter Root of New Caledonia [central British Columbia] (which by the way appears to me to be nearly identical with the Tiger-Lily of our gardens) might perhaps be entitled to some little note as a bonne-bouche if cultivated in England. The mode of preparing it is either in small subterranean kilns [roasting], or by steaming until soft and mushy. It is easily raised from the seed, of which I have sent a supply; there is also some bulbs, but I fear their germinating principle will be destroyed before they reached their destination. Professor Turner says of the Tiger Lily: “The Tiger Lily is a tall perennial with a white ovoid bulb, up to 5 cm in diameter, composed of thick fleshy scales like garlic cloves.” The stem is slender, the flower bright orange with dark spots near the centre. The flavor of the bulb was strong, peppery and bitter, and they were used like pepper or garlic to flavor foods. The Tsilhquot’in called the bulb “beaver-stick,” and harvested them in early spring. The Okanagan and other Natives harvested them in the fall. Anderson also called another plant “bitter-root,” and this was a plant he also called spetlum. Nancy Turner describes this plant, too: Bitter-root “is a low stemless perennial arising from a branching deep-seated fleshy taproot, which is grey-skinned with a white inner core that may turn pink on exposure to the air.” It grows in the driest areas of interior British Columbia, and is now considered rare. To the Okanagan and Thompson River Natives, it was the most important of all edible roots. Among its other names is the name, “spatlum,” almost the same name Anderson gave it in the 1840’s. Another plant called the Spring Beauty might be one of the Indian potatoes harvested on Potato Mountain. The Spring Beauty is a perennial that grows 5 to 15 cm tall with one or more stems arising from a shallow corm that might be 5 cm or more in diameter. It grows in dry sagebrush hills, usually at higher elevations in central and southern part of the province, on both sides of the Coast range. The Tsilhquot’in dug up the corms after the plants had flowered, from late May to Late June depending on the elevation. They used a short digging stick to pry them out of the earth, and replanted the smaller corms to allow them to develop. They cooked the bulbs by steaming them, or washed them and boiled them like potatoes. In fact the Spring Beauty tastes much like potatoes, but are a little sweeter. Apparently this massive Wapato garden was recently discovered near Vancouver, and the story is very interesting! The comments are also a lot of fun to read. Copyright, Nancy Marguerite Anderson, 2017. All rights reserved (except, of course, those that already belong to The History Blog). Very interesting. Wapato was also a native staple on the lower Columbia. Thanks, Tom. I hadn’t known the original name of Sauvie Island. 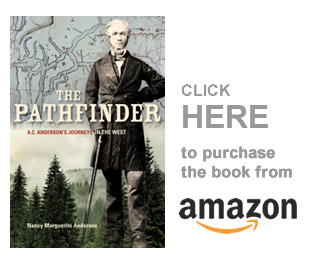 Laurent Suavé dit LaPlante was also with the 25-man party looking for a place to build an HBC fur trade fort on the Fraser River in 1827. That fort became Fort Langley.